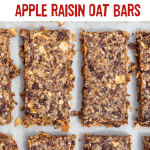 These apple and raisin bars are the best snack. We’ve had lots of early starts and busy days running around from meeting to meeting and these have been a total saviour. Make a big batch at the weekend and then grab a few as you run out the door in the morning to keep you going. They’re quickly becoming our staple speedy breakfast and mid-morning snack at home and in the office. Preheat your oven to 335 F and line a baking sheet with baking parchment. Put 3/4 of the raisins in a food processor along with the coconut oil, rice syrup, cinnamon and salt – blend until completely combined. 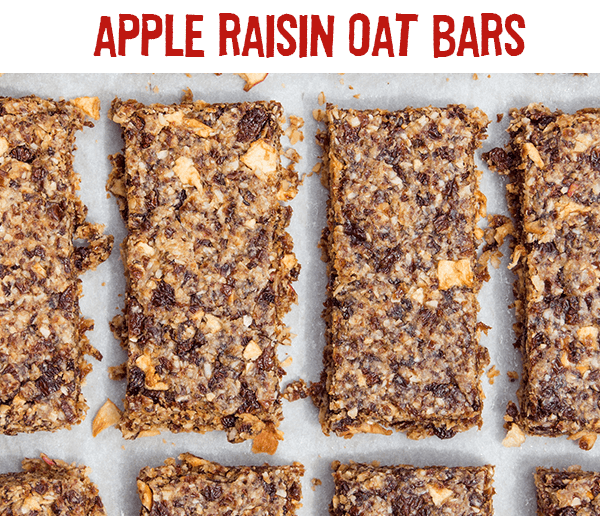 Once combined, add the last 1/4 of raisins, oats and dried apple pieces, give it another very quick whizz to mix it all together. Transfer the mixture to the baking tray and press down very well, making sure it is all evenly spread. Bake in the oven for 20-25 minutes until golden. Once baked, remove from the oven and put in the fridge to cool down for 15-20 minutes before cutting into bars.